I realize Father’s Day was over a week ago, but I wanted to share what the kids and I put together for their awesome daddy/step-daddy. We stopped by my favorite rusty door with some big metal letters for a quick little photo shoot. It was very simple and turned out really cute. Jack and Abby love their big brother so it was easy to get them all snuggy on him for that middle shot. I had the pictures made into three 4 x 6 box prints for him to put on his desk at work. 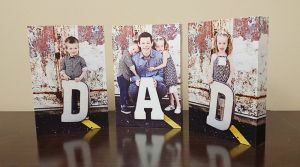 These box prints have the “wrap” style of a stretched canvas, but are made of wood so they have a smooth finish. In most situations I prefer the box print over stretched canvas since the smooth finish offers better picture clarity. The small ones can stand up on their own (see the second pic below), but they come in many different sizes and look great up on the wall. Sooo… if you’ve run out of cool gift ideas for family or would like to create a gallery wall of your own, let’s get started! Turnaround on a project like this (from shoot to pretty box print on the wall) is approximately 2 – 3 weeks. Click HERE to book your photo session and get the ball rolling! 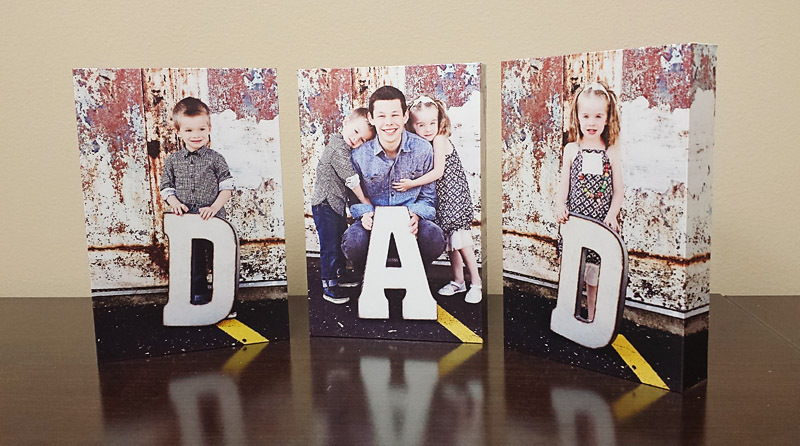 This entry was posted in Father's Day and tagged child photography, east peoria photographer, family photography, Father's Day, germantown hills photography, metamora il photography, peoria illinois photographer, photo gift ideas. so sweet of all three beautiful children, love those backdrop boxes!